Director/Story – Andrew Stanton, Co-Director – Angus MacLaine, Screenplay – Andrew Stanton & Victoria Strouse, Producer – Lindsey Collins, Photography – Jeremy Lasky, Music – Thomas Newman, Animation Supervisors – David DeVan & Michael Stocker, Production Design – Steve Pilcher. Production Company – Pixar Animation Studio. It is one year after Marlin went on his quest to find Nemo. He, Nemo and Dory now live on the reef. 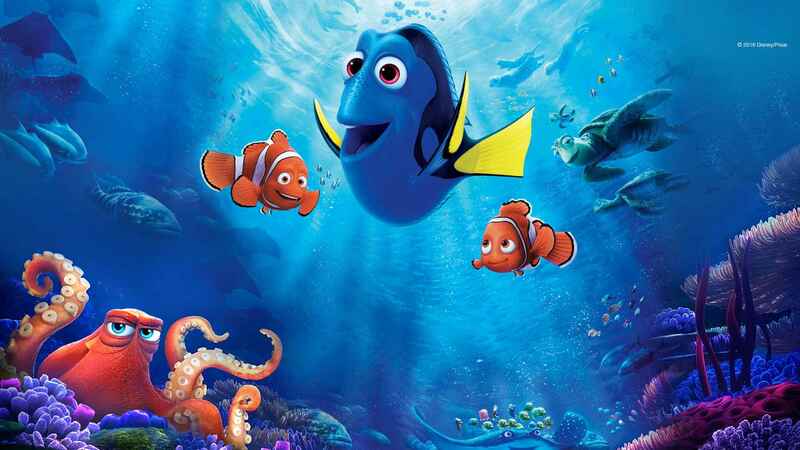 Dory begins to have flashes of memory and longs to find her parents again. They set out towards the Marine Life Institute on the coast of California where Dory recalls being born. After an argument, Marlin and Nemo are separated from Dory and she is netted by workers at the institute. Once inside, Dory recalls that her parents lived in the Open Ocean Exhibit and gets the help of the seven-armed octopus Hank in an effort to find her way to the tank. Meanwhile, Marlin and Nemo hatch a scheme to get into the institute to rescue Dory. Pixar used to be on top of the world with a string of unbroken hits that ran from their first film Toy Story (1995) through A Bug’s Life (1998), Monsters, Inc. (2001), Finding Nemo (2003), The Incredibles (2004), Cars (2006), Ratatouille (2007), Wall-E (2008) and Up (2009). A funny thing happened around the late 2000s when the studio was in hardball negotiations over whether to stay with parent company Disney. Pixar eventually won, John Lasseter was appointed chief creative officer at Disney and Pixar regained the right to sequelise their own films from Disney. However, this seemed to presage a fundamental change in the studio’s focus after that point. From around 2010, Pixar embarked on a string of weaker sequels – Toy Story 3 (2010), Cars 2 (2011), Monsters University (2013), Cars 3 (2017), Incredibles 2 (2018) and Toy Story 4 (2019). Original material was sporadic and came out as either damp squibs like Brave (2012) or box-office duds like The Good Dinosaur (2015) with the only halfway reasonable efforts to emerge during this time being Inside Out (2015) and Coco (2017). Moreover, Pixar creative talents seemed to get big heads and as part of the deal several of them had their live-action directorial outings bankrolled by Disney – only for these to end up as expensive box-office flops like John Carter (2012) and Tomorrowland (2015). Finding Nemo was one of Pixar’s greatest successes. Nobody seems to have any bad words to say about it. It is the third highest grossing Pixar film of all time (the No 1 if you adjust for inflation) and the second highest grossing worldwide. It is no surprise then that it is one that Pixar turn to sequelising here. The surprise name back on board is Andrew Stanton who has been writing Pixar scripts since the beginning, directed Finding Nemo and Wall-E, and has no doubt returned to the familiar after the box-office drubbing taken by his live-action venture with John Carter. Finding Dory emerges likeably. Like Inside Out, it is still not hitting the heyday of where Pixar were at before 2010; it belongs more on the second rung of efforts like A Bug’s Life and Ratatouille. It takes a long time for the film to reach its stride. The first half is surprisingly murky. One of the standout things about Finding Nemo in my memory is what a vibrant colour palette the film had. By contrast here for some reason, the film seems to have gone with the grey-greens of light reflected underwater or the dankness of fish swimming through algae-encrusted pipes. Which may well be the insertion of realism but makes for a much more visually dour film (even more so if you are watching it through 3D goggles). 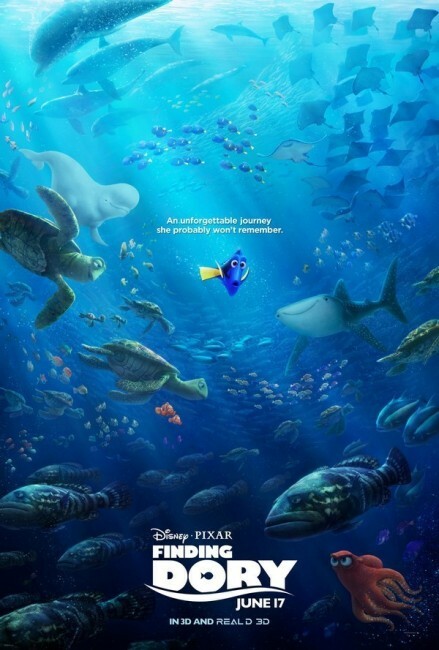 The story this time goes from a focus on finding Nemo to finding Dory – there is a B plot about Marlin and Nemo trying to find where Dory is in the aquarium but when it comes to the main plot, the film should have more accurately been titled ‘Finding Dory’s Parents’. Marlin and Nemo are now supporting characters and Ellen DeGeneres’s Dory allowed to come to the forefront (as well as Sloane Murray who does an absolutely adorable baby Dory). The additional spin that we get on the original’s quest plot is that this involves the characters variously breaking in, attempting to rescue/rejoin one another and then breaking out from a marine world. This is a great of fun as the story hops from one pool and tank to the other. There are some delightfully wacky set-pieces involving the octopus Hank commandeering a child’s strollers or carting Dory in everything from a coffee pot to a child’s bottle to a water bottle. The finale the film reaches with the octopus hijacking a truck and Dory hatching a rescue scheme that involves sonar tracking the path of the vehicle along the highway and her being flipped up onto it via a whale’s flipper, not to mention the glorious slow-motion climax of the scene, is one of the most dementedly madcap set-pieces that one is likely to see in any Pixar film. The film is not without is soft and heart-warming moments – the scene where Dory finally finds her way home is an absolutely adorable one that leaves few dry eyes in the house. 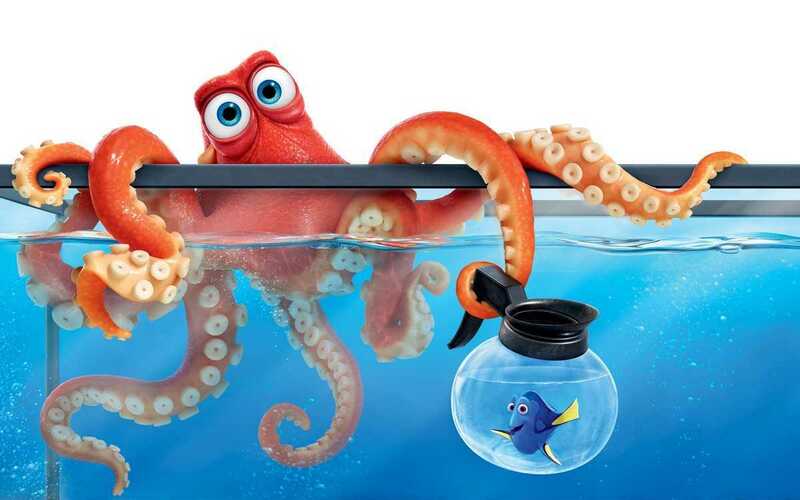 One of the best things about Finding Dory is its characters. Aside from the return appearances of familiar ones, we get a winning line-up of new ones. The overriding theme of Finding Dory now seems to be one of triumphing over adversity despite physical/mental handicaps. The new characters include Destiny, the short-sighted whale shark; Bailey, the beluga whale with a fear of using his echolocation; Idris Elba and Dominic West as a pair of grumpy sea lions basking on the rocks outside the marine world and shooing away a persistent interloper; a somewhat disturbed duck who imprints on Marlin; even Sigourney Weaver as herself voicing the aquarium’s P.A. system. Although the most winning of these is Ed O’Neill, no less than Al Bundy of Married … With Children (1987-97) fame, as the octopus, or septopus as dubbed by Dory (apparently because the Pixar animators found it too difficult to animate eight arms), who manages to steal most of the film with his gruff delivery and chameleon-like abilities to blend in with almost any surrounding.